Pin it! 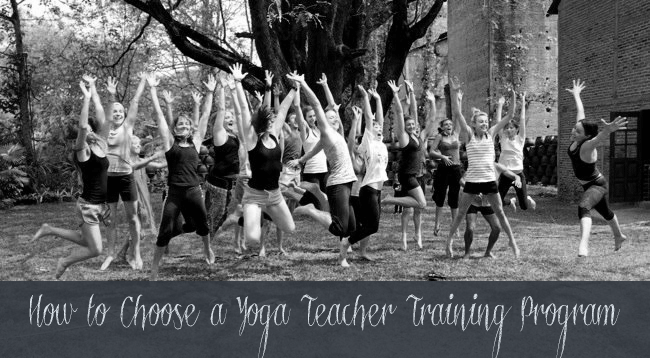 How to choose a yoga teacher training program. Yoga teacher training was one of the most difficult things I've ever done (which is probably why we're all jumping for joy in the above pic on the last day of training). But it was also one of the best things I've done for myself. Recently, I've received a few emails asking for tips on how to choose a yoga teacher training program, so I came up with these six things to consider. If you're a yoga instructor, I'd love to know what you would add! 1. Pick a type of yoga. The first step to narrowing down the list of potential trainings is to figure out what kind of yoga you want to focus on in your training. What type inspires you the most? Anusara? Kundalini? Ashtanga? 2. Research the program. Unfortunately, there are some not-so-great programs out there. You want to look for a 200 hour program or something similar that covers anatomy and physiology, philosophy and history of yoga, adjustments, props, pose breakdown, business ethics, and meditation and breath work. Look for something that has a lot of classroom hours. There are some trainings that, for example, have a few classroom hours, but then you need to go home and film yourself teaching a "class" (could be your friends from home) and send it in for classroom credit hours. Be wary of this. While it's certainly easier, it's not going to give the prospective teacher confidence, nor quality experience, nor an opportunity for honest feedback. Depending on where you're planning to teach afterwards, it may also be important for you to look for yoga programs that are a part of the Yoga Alliance Registry. 3. Research the instructors of the program. Trainings are not cheap, and most are priced between $2,500 and $6,000 (though Bikram will run you around $11,400), and the trainings are intense. Plan to be around the instructors for at least six hours per day. For these reasons, it's important, at least in my opinion, to make sure you'll mesh well with the instructors. Check out the instructors' youtube channels, Facebook accounts and any other social networking accounts they might have to get a sense for their personality and teaching style. If they don't have a strong online presence, send an email and see how the correspondence goes. Sometimes yoga people get a bad rap for being free spirited. While I'm a firm believer that everyone has something to offer, for my training I was interested in finding disciplined, thorough, focused teachers with excellent communication skills. 4. Know what to expect. Considering the expense and intensity level of the training, there shouldn't be any surprises. Look for a sample daily schedule, a list of required reading, descriptions of the venue and its accommodations, and meal plans. Know exactly what you're expected to bring, and what's allowed/not allowed on the property- some trainings do not allow eating meat, or smoking, or alcohol, so if these things are important to you, be sure you know ahead of time. 5. Understand the fine print. Make sure you know ahead of time what is expected of you in order to graduate from the program. Is there a test? What happens if you don't pass? What is the cancellation policy? What happens if there's an emergency and you need to leave early? What happens if you get injured or sick while in training? While it's probably not normally a good idea to go through all the what if's in every single thing you do, I think it's beneficial when considering a teacher training program because it's a large financial and personal commitment so it's good to have your bases covered. 6. Develop a strong personal practice. Teacher training is physically and emotional demanding. Yoga practice is often twice daily, with a third practice focused just on teaching methodology. Therefore, it's best to go into training with a strong personal practice so you can physically be ready for the training because it won't be much fun if you're too sore to move each day.